Powered by REDLITHIUM® USB, the Milwaukee® USB Rechargeable ROVER™ Pocket Flood Light delivers 445 lumens of TRUEVIEW™ High Definition output, and is capable of all-day runtime, over 2,000 recharges and 3X faster charging via USB. Stick, clip, and carry it anywhere with its dual magnet clip, perfect for mechanical, electrical, H/VAC-R, MRO, and automotive trades. The light is impact and chemical resistant to withstand harsh environments. With two light output modes users can maximize brightness or extend runtime with up-to 11 hours of light on a single charge. 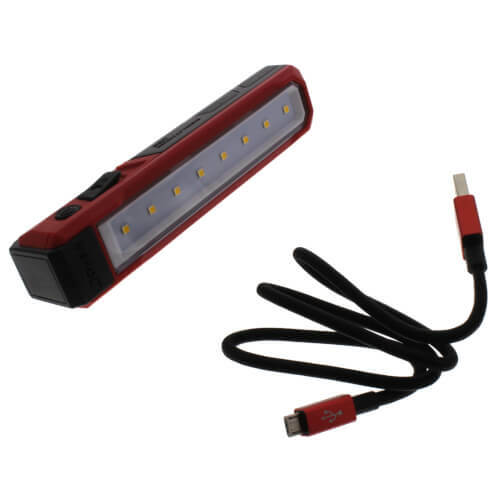 The REDLITHIUM® USB Battery can be recharged in the light via Micro USB or swapped out with additional REDLITHIUM® USB Batteries for virtually no downtime. The Milwaukee® USB Rechargeable ROVER™ Pocket Flood Light is covered by a limited lifetime warranty.